The compositions from Der Fluyten Lust-hof bear unmistakable witness to Jacob van Eyck’s own virtuosity: Utrecht’s blind municipal carillonneur played his recorder variations on summer evenings in the Janskerkhof, the St. John’s churchyard. In the present book the repertoire is scrutinized from a variety of perspectives: sources, transmission, interpretation, and the boundaries between improvisation and composition, to name but a few. A revealing section of this study is Chapter 5, which explores the relationship between Van Eyck’s recorder and carillon practices. 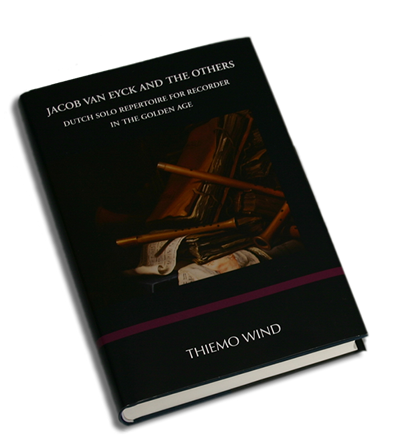 In order to place Van Eyck’s oeuvre in a broader context, the author has chosen to extend the scope of his research to include comparable works by Dutch contemporaries (Paulus Matthijsz, Jacob van Noordt, Johan Dicx and Pieter de Vois), from the anthologies Der Goden Fluit-hemel and ’t Uitnemend Kabinet. Inclusion of these ‘others’ avoids presenting Van Eyck as a lone figure: he was, after all, a child of his time. The last four chapters focus on various aspects of performance practice, including instruments, time, ornamentation and delivery. The future of this repertoire is entrusted not to musicologists but primarily to performers themselves. It is on them that Jacob van Eyck – and ‘the others’ – will have to rely.